When an announcement appeared on GoodOldGames.com Sunday saying that the company was "closing down the service," many gamers were understandably worried about their rights to access digital versions of the games they had purchased from the website. Despite assurances that the company would find a way to make those games available in the near future, the statement mystified many gamers. But the prospect of having access to the games again, and the company's statement that GOG.com "cannot remain in its current form" led more than a few to speculate that GOG.com was merely being relaunched or folded into a larger service. Today, GoodOldGames.com confirmed those speculations by announcing a new, redesigned website. The company's spokespeople, dressed as monks, revealed the details of the redesign and also announced that Baldur's Gate would be added to the service. The site has been made easier to use, which is a claim so common to these presentations that it's almost not worth repeating. (No one ever says of a redesign, "We wanted to make the site harder to navigate.") Users will also have the option to create mixes of certain games that share specific associations. It's quite a marketing stunt, and it seems that GOG.com feel these misleading statements and the inconveniences caused to its customers is a fair way to generate buzz for the relaunch. 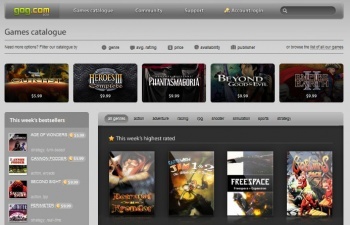 Gamers who paid for digital copies of games through GOG.com were told that the service was closing and were unable to access the content they owned for a few days and, given the ambiguous nature of digital media ownership, GOG.com may have generated an unnecessary amount of negative interest in its brand. "First of all we would like to apologize everyone who felt deceived or harmed in any way by us closing down GOG.com without any warning and without giving access to your games. We apologize for that from the bottom of our hearts!" In talking with PC Gamer, GOG.com goes further to say, "we don't have a huge marketing budget and this why we could not miss a chance to generate some buzz around an event as big as launching a brand new version of our website." A counter on the site reveals that the new version of GOG.com will launch tomorrow morning at 8am EST.